This project began in early December of 2014. it was originally a commission, but the deal ended up falling through, and i never got paid for it. hopefully i can find someone out there to buy it from me to make up for my losses. The original concept was based around the Synare3 circuit. the Synare3 consisted of two CMOS oscillators, a white noise generator, a four-pole resonant lowpass filter, a voltage controlled amplifier, and two envelope generators that modulated the filter cutoff and VCA amplitude. My task was to build a modern variation on the circuit that would enable CV/EXP. PEDAL inputs to the oscillators, filter, and VCA. this would mean replacing the CMOS oscillators with voltage controlled oscillators. i was also asked to add the ability to 'transpose' the oscillators frequency range, create multiple waveforms, add a 'crossfade' between one oscillator and the noise generator, add a line-in mix, and a pushbutton switch that would fully trigger the envelope generators. with all of this on the list, i began designing a circuit that would achieve it all. in the end, the circuit was quite a bit different than the original Synare3 schematics i was able to find. for the VCOs, i used a basic dual op-amp design that produces both square and triangle waveforms, and has a pretty decent frequency range. transposing the VCOs would just be a matter of switching in additional timing capacitors. the white noise generator in the original schematic was not giving me very good results, so i ended up using the two transistor type that i have used in the past with the NT02 series. it works well, but the circuit requires at least 10vdc. since the buyer asked that the finished product be powered by a standard 'center-positive' 9vdc supply, i would also have to build a 'charge-pump' circuit to create the necessary voltage for the noise generator circuit. like the NT02 rev.b, i used a mirrored signal from 'oscillator 2' to drive the charge-pump voltage multiplier. the filter in the Synare3 originally consisted of four separate 'OTA' 6db lowpass filters in series to create the four-pole filter. the circuit originally used the CA3080. in the interest of space and cost, i decided to use the dual package LM13700 instead. i felt that the fourth filter in the chain was not really necessary in this circuit, so i cut the filter down to three poles, and used the fourth OTA for the VCA. i was able to cut down my OTA needs from five single amplifier chips to two dual chips. also, i didn't really see the need for two separate envelope generators, and the buyer only wanted one decay control knob, so i only built one to control both the VCA and VCF. in the end, the only thing that stayed original to the Synare3 was the drum-sensor/envelope-generator circuit. the seller also insisted that the sensor be a 3 inch loudspeaker like the original Synare3. the speaker did have a more natural response(maybe), but when the deal fell through, i ended up switching it out for a piezo instead. the speaker was just not sensitive enough for finger tapping. i also ended up adding a lot of different modulation routing to the LFO, VCO, VCF, VCA, etc. the finished product does well as a drum synth, but excelles as a drone synth. plugging other signals in to the trigger input is especially fun. it can take LINE, MIC, INST, and other sensor inputs safely. the buyer had also asked that the VCOs, VCF, and VCA have standard 0~5vdc CV inputs that doubled as expression pedal inputs. this was new territory for me. 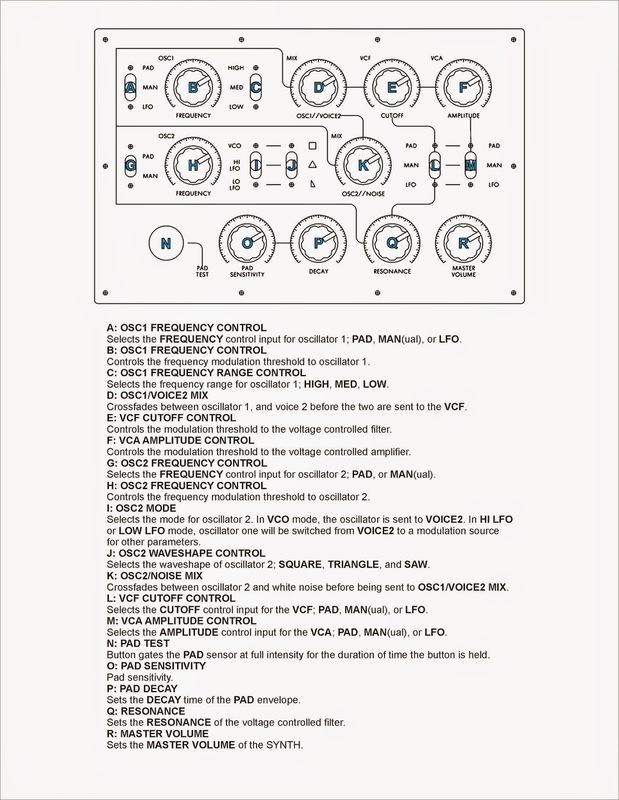 i didn't understand how you could send 5 volts to a jack in a TRS situation, and then just short that 5 volts to ground when you plug in a TS jack, but the buyer knew what he wanted, and it is common for newer moog and roland gear to have this option. after a couple of days trying to come up with some sort of current sensing switch that would disconnect the 5 volt supply when shorted, i ended up just asking to borrow someones moog pedal to see what they do to overcome this. 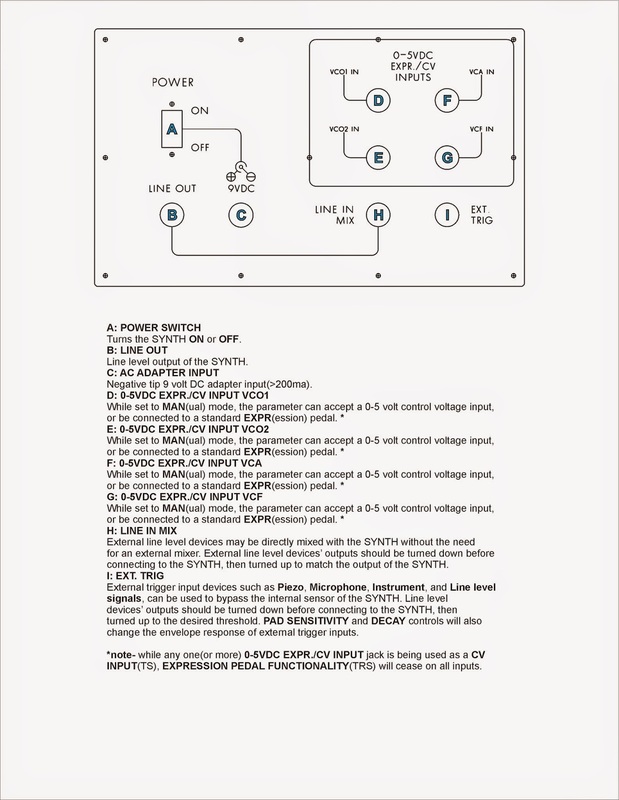 ironically, the instructions on the bottom of the moog sent me to their website, where the manual with the description of the circuit is. all it really ended up consisting of was a dedicated 5 volt supply that was limited to 5ma per output. if one of the four was shorted to ground, the rest would not be able to power an expression pedal. if all four are connected to TS CV inputs, the circuit will draw no more that 20ma. since this thing isn't running off of batteries, it's not a big deal. so i was able to do it the way moog does. i just added a 7805 regulator with four separate 1k resistors coming off of it to the four CV/EXPR inputs. the LINE-IN MIX jack was pretty basic. the buyer really just wanted to have the option of mixing another LINE-IN without the need of an external mixer. the LINE-IN has a little bit of gain too, so the signal can be summed from the external device's volume control. the body of the synth is made from laser-cut wood, and the faceplates are laser-etched hand-cut sheet metal. working with sheet metal can be a pretty stressful when you don't have the right tools. my second try turned out much better than the first. i wasted a lot of hours, but it was a good learning experience. thanks! i ended up using a skilsaw with a sheet-metal blade. the hardest part is getting hard lines. it took a lot of filing and sanding to get it right. the holes were difficult too. i used my laser cutter to mark all of the areas to cut out. engraving center-points in the holes really helped keep the drill centered too. then it's just a matter of carefully filing them out to shape. the final faceplates were actually my second attempt. lost an entire day on the first one. oh well, learning experience. Great work as usual. I've been stalking your blog anticipating your next build. Funny, I just got a original synare 3x. Needs alot of work. For starters the pad has dry rotted. What did you use as the drum pad in this project? I've been thinking of buying a round mouse pad to replace the dry rotted pad. Thanks! I used a thick rubber mouse pad. I used DAP non-flamable contact cement to afix it. There are other types of foam rubber out there too, but some mouse pads are really built to last. Look around for a good one. This is a great article, thanks for sharing this informative information. I will visit your blog regularly for some latest post. I will visit your blog regularly for Some latest post. Thank you for nice write-up! Being able to write creatively is something not all of us are capable of. Count yourself blessed because you have a talent. Almost all promoted finished up composed of has been a separate 5 volt offer that has been restricted to 5 ma every end result. when one of many several has been shorted to be able to soil, the others wouldn't normally manage to strength an expression pedal. Wonderful work as common.I have been previously stalking your blog planning on the following create. Interesting, I merely acquired a new initial synare 3x. Requires numerous operate. First off your sleep pad features dry out rotted. This is really nice! It is good to find a nice hobby that you enjoy doing especially on your free time. It relaxes the mind.. I really like what you've done with this, do the vcos track nicely over 1v /oct ?